Are you implementing Microsoft Skype for Business? SSW can help. SSW can install, setup, manage and backup your Skype for Business solution. Our Expert Skype for Business consultants can assist resolving problems with existing Skype for Business solutions. Skype for Business is the premier phone system from Microsoft. It features instant messaging, Voice Over IP and Video Conferencing inside the Skype for Business client software. Availability of contacts is based on Microsoft Outlook calendars stored in a Microsoft Exchange Server. Contact lists can be retrieved from a local directory service, like Microsoft Exchange Server. Microsoft Office can show if other people are working on the same document. All communication between the clients is done through a Microsoft Skype for Business Server. This makes communications more secure, as messages do not need to leave the corporate intranet, unlike with the Internet based Skype or the old Windows Live Messenger.. The server can be set to relay messages to other instant messaging networks, avoiding installation of extra software at the client side. A number of client types are available for Microsoft Skype for Business, including mobile clients. Uses SIP as the basis for its client communication protocol. Offers support for TLS and SRTP to encrypt and secure signalling and media traffic. Collaboration through Whiteboard documents, where the participants have great freedom to share text, drawing and graphical annotations. Desktop sharing, usually by allowing participants to see and collaborate on your windows screen. All collaboration sessions get automatically defined as conferences, where clients can invite more contacts. Conference initiators (usually called organizers) can either promote participants to act as presenters or demote them to act as attendees. They can also define some basic policies about what presenters and attendees are able to see and do. Deeper details of policy permissions are defined at server level. SSW can help you install, setup, manage and backup your Skype for Business solution. SSW runs its own Skype for Business infrastructure, so you can be sure that our consultants have hands on experience when it comes to supporting your Skype for Business in a critical business environment. Know whether others are available to communicate. Repeatedly attempting to reach each other by phone or email is a common communication problem in today's business world. Often the problem stems from workers who are physically separated by geography and time zones and who lack visibility into other people's availability or presence. Presence information is especially important when there is a need for a critical business discussion or a time-sensitive decision has to be made. Skype for Business helps organizations increase individual productivity by adding presence, IM, and PC-to-PC audio and video calling to the business IT infrastructure. 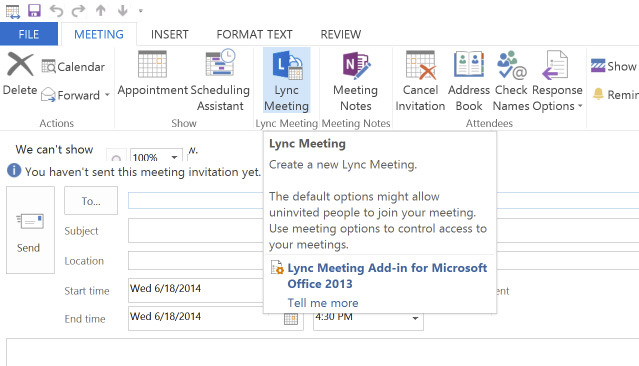 Setup meetings via Microsoft Office Outlook Appointments (plus Presence information). Collaborating with others can be challenging for workers whose jobs require constant use of business productivity applications during the work day. Skype for Business connects presence and real-time collaboration capabilities with the Microsoft Office Outlook messaging and collaboration client. This enables higher productivity by allowing workers to collaborate using the programs they're already familiar with. Connect instantly with people and be more productive through a rich meeting experience. meetings enable users to connect wherever they are through PC-based audio, video, and web conferencing, both as scheduled meetings and spontaneous, ad hoc collaboration sessions. With Skype for Business, users can collaborate, share information, and coordinate their efforts in real time, all within the context of an existing workflow. Skype for Business supports an integrated conferencing experience, enabling users to join the same conference from the PC (via the Microsoft Skype for Business 2010 and 2013 client) or from a phone (requires a separate dial-in audio conferencing service from a qualified partner). Skype for Business serves as the presence engine for SharePoint team sites and portals, providing presence and IM access from within Windows SharePoint Services and SharePoint Server sites. For example, users can enable the Members Web Part to see the presence of anyone associated with a SharePoint site, which allows information workers to spend more productive time in their business productivity applications. Communicate with other organizations running Skype for Business. The federation feature of Skype for Business establishes trusted relationships between an organization and one or more external organizations. This allows users to see user presence and communicate using IM and PC-based audio and video across organizational boundaries. Communicate with Skype (or the old Windows Live Messenger) contacts. Skype for Business enables your users to connect with Skype or the old Windows Live Messenger contacts using IM, audio and video calls directly from Skype for Business. Reduce costs. Skype for Business facilitates rich and engaging communications across and outside an organization without expensive business travel or costly phone bills.